Jawbone’s new BIG model improves on already excellent Jawbone, and features an additional five hours of battery power for nearly 15 hours of party-power and 25 more decibels thanks to a second passive subwoofer which hopefully doesn't just sit there being all like "whatever" when you try to kick out some jams. Nearly double the size of the deceptively powerful, super-portable original, it's still small enough that you can tote it off to wherever there's a soiree to be livened up, and the Big shows off Bluetooth capability and built-in mic so you can hook up nearly any smartphone and bring your ventiloquism act to the next level. Since it works with your smartphone is makes for one heck of a badass speakerphone. 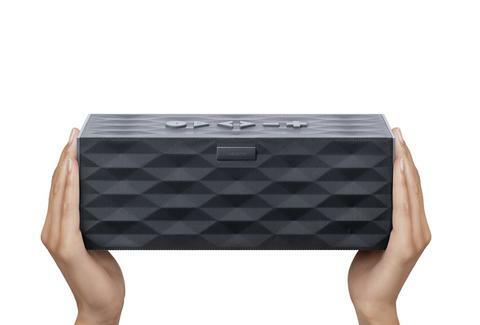 So whether you're sitting in the conference room getting lectured by your boss or "listening" to your girlfriend while she talks about her day, hearing it through the BIG Jambox will make it at least sound good.